The fifth season of Doctor Who saw another cast change, as well as a few recent discoveries. Two recently discovered serials (or nearly-complete serials) were released on home video in 2013. 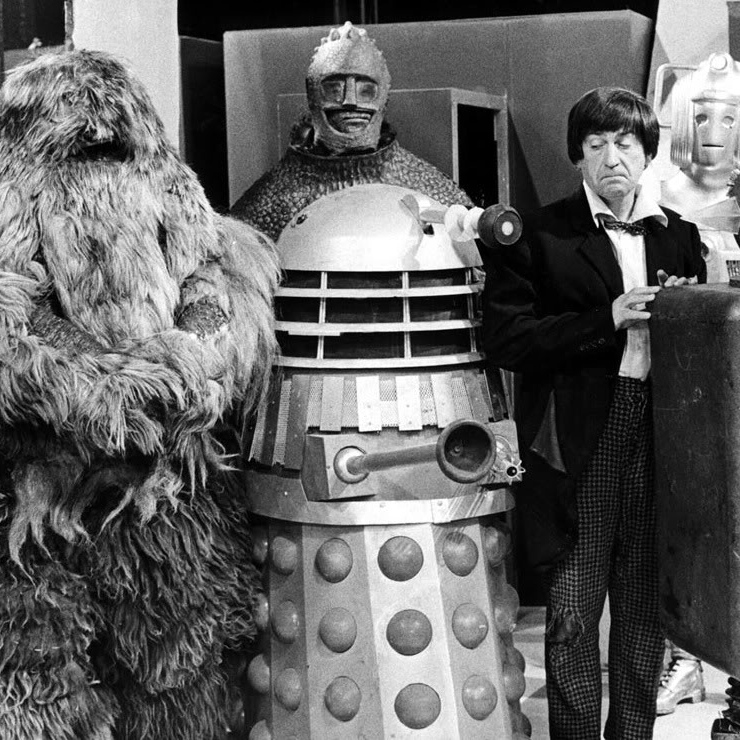 The season featured two battles against the Cybermen, and two against robot yetis. More on all that in just a bit. There were 7 serials (the fewest in any season so far) consisting of 40 episodes. 21 episodes are missing. Only two serials are complete, and one of those was only made complete in 2013 after the discovery of a copy of the episodes in Nigeria. One serial, Fury from the Deep, is missing all its episodes, the last serial to have no surviving tapes. Only two more serials after this season are missing any episodes; the rest of the series is complete. Victoria Waterfield (Deborah Watling) left in a late-season adventure, and Zoe Heriot (Wendy Padbury) joined The Doctor and Jamie as the season concluded. There were one production goof that caught my eye and ear. Jamie, who's from 18th century Scotland, used a 19th century phrase, "gives me the willies" in The Abominable Snowmen (6 episodes, 5 missing). 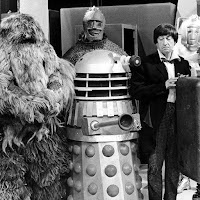 By the way, the yeti in The Abominable Snowmen and in The Web of Fear (6 episodes, 1 missing but reconstructed by BBC) -- the second and fifth serials respectively -- reminded me of Ro-Man from Robot Monster, except for lack of a diving helmet. I don't like abominable snowman shows unless I have Joel or Mike and a couple of robots helping me watch it. The third serial, The Ice Warriors (6 episodes, 2 missing) has been released on home video with the two missing episodes animated. Unlike the Season One Reign Of Terror animated episodes, which looked like graphic novel style, the animation of The Ice Warriors is more like Johnny Quest or Adult Swim's Sealab 2021 animation. The Web of Fear was also released on home video in 2013, but with reconstruction, not animation for the missing episode. I wish they had animated it. To me, the most interesting serial was The Enemy of the World (6 episodes). Patrick Troughton played the villain as well as The Doctor. Even though the characters looked alike, they didn't. Troughton's talents as an actor made them appear to truly be different characters. In the season's 6th serial, Fury from the Deep (6 episodes, all missing), Victoria decided to remain behind, tired of the constant danger The Doctor found himself (and his traveling companions) in. As has been the pattern, in the next serial, The Wheel in Space (6 episodes, 4 missing), The Doctor gained a replacement companion for the one just lost. Zoe Heriot (Wendy Padbury) stowed away aboard the TARDIS after the defeat of the Cybermen, and would be part of the crew for the next season. Now off to the TARDIS to land on Season Six. I'm working my way through the newer stuff but started downloading all the old seasons. I watched many of them back in college but it's been a long time. I have to admit I am thoroughly enjoying the new stuff (and Amy Pond is smokin' and has a really cute accent. Too bad she went psycho and cut off all her hair (the actress, not the character)). Hmm. I had no idea that so many episodes were missing. I've been reading the Wiki article on this. It's quite fascinating how many shows have completely disappeared from those years. Doctor Who is actually an exception in that many episodes still do exist because it was so popular. A shame. I guess we are used to everything being stored almost to excess these days. Karen Gillian, who played Amy Pond, did not go psycho. She cut off all of her hair for a part. She's in an upcoming horror movie, which required her to cut off her hair. Matt Smith (the Doctor) had to cut his hair off for a part as well. Do you also consider him psycho? A huge event took place in this season! I think it was during The Web Of Fear, but I could be wrong. Terrence Dicks joined the production crew. He is the one who come up with most of the things a lot of fans feel define Doctor Who. The Time Lords, why the Doctor left Gallifrey, the Master, the term regeneration (it was already part of the show but he named it). I don't care what Matt Smith looks like. Karen Gillan is drop dead gorgeous and no woman looks good with her head shaved. Terrence Dicks didn't start doing work for DW until season six. The big deal about "Web of Fear" was the introduction of Nicholas Courtney as Colonel (later Brigadier) Alastair Lethbridge-Stewart. He'd become a regular for a few years starting with Jon Pertwee and would make appearances throughout the rest of the show's history, even into the 21st century with the audio stories.